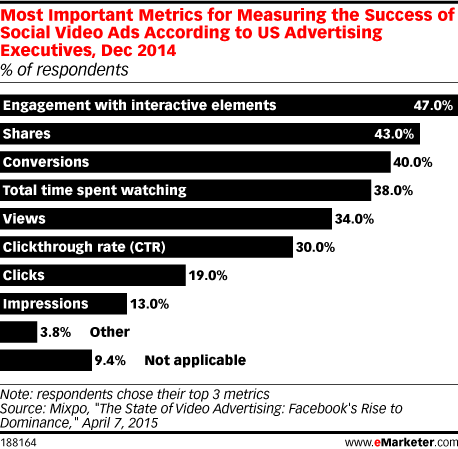 Data is from the April 2015 Mixpo study titled "The State of Video Advertising: Facebook's Rise to Dominance." 125 US agency, brand and publisher executives were surveyed during December 2014. Companies included brands (9.3%), creative agencies (27.8%), digital agencies (31.5%) and media agencies (31.5%). Company clients included B2C clients (61.1%), B2B clients (14.8%) and both equally (24.1%). Respondents identified themselves at the executive level as CMO, SVP and VP of marketing. Other respondents identified their titles as account executive, brand manager, creative director, director of ad ops, media planner and social media manager.